According to early data, GAME OF THRONES’ season three premiere March 31 on HBO topped the series’ highs, with record viewership for both the 9:00 p.m. (ET/PT) airing and gross audience across the three plays. At 9:00 p.m., itaveraged 4.4 million viewers, outperforming (+4%) the previous high of 4.2 million viewers from last season’s finale. 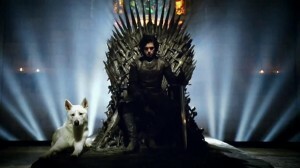 GAMES OF THRONES improved 13% in comparison to last season’s premiere of 3.9 million viewers. Across the three plays for the night, 6.7 million viewers tuned in, surpassing last season’s debut night of 6.3 million viewers by 7%. Last season, GAME OF THRONES had an average gross audience (HBO linear plays + HBO On Demand/HBO GO + DVR) of 11.6 million viewers. This entry was posted on Tuesday, April 2nd, 2013 at 12:29 pm	and is filed under News, Television. You can follow any responses to this entry through the RSS 2.0 feed. You can skip to the end and leave a response. Pinging is currently not allowed. Where'd you get this evidence? It fell into my lap.